Recipe – Slow Cooker Pot Roast & Homemade Gravy! More Ideas for Your Meal Plan! You can tell that a big holiday is coming – the grocery ads are crammed full of deals on hams, prime rib, veggies and baking supplies. 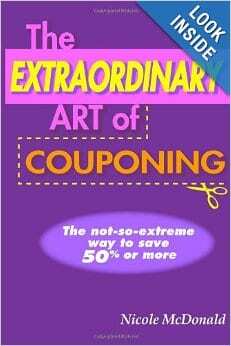 This week has some great sales! Be sure and check them out here on Nicole’s Price Matching List. Spiral Ham – This recipe is from Tasty Kitchen and I’ve never been disappointed by one of their recipes. I’ve never made a ham before, but maybe it’s time! I love leftover ham – for breakfast or even in a hot ham & cheese sandwich. Slow Cooker Boneless Pork Ribs – WOW! I’ve never thought of making these, but I bet I’d have one happy husband if I did. If I can get out to Fareway during their 2-day sale, this recipe is gonna happen. Tacos – Sometimes, in the busy weeks of preparing for holiday, we need easy recipes. Tacos are that easy “recipe” for me. Pull some taco meat out of the freezer, add shells and taco toppings and I’m done. Easy! Chicken Tortilla Soup – My husband loved this soup. I simplified by leaving off the corn chips and using cooked chicken from the freezer and it came together really quickly. Great for a cold night! I hadn’t ever been a big fan of pot roast. My mom would make it growing up and it was just okay for me. Then a year ago, I discovered a Balsamic Pot Recipe and my love for it started! 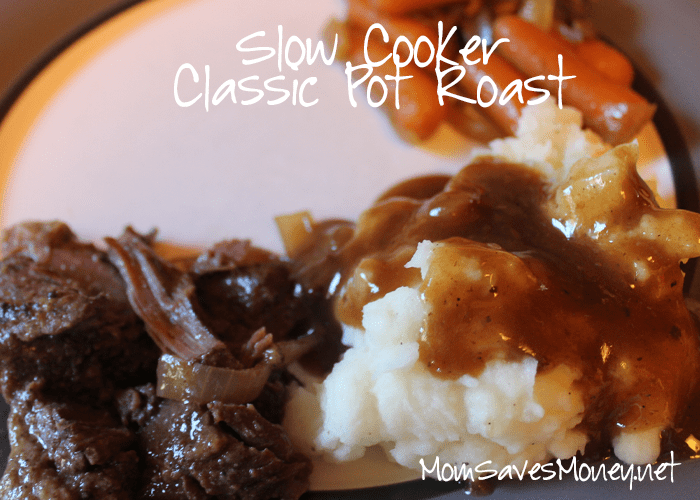 Today, I’m sharing my latest pot roast find – a nice, classic, but still a slow cooker recipe. Now, I don’t think this is a super frugal meal – even when you buy roasts at their stock up price, I still think it comes out to be more expensive per person than normal meals (that I serve anyway). But what a comfort food! And there’s nothing to say that you have to serve the roast as a big roast dinner. Make it. Shred it. Use them in sandwiches instead. Or even in quesadillas. That’ll help the roast go further. But it’s still very tasty! I’ve modified it only slightly from the source – I just didn’t think it made enough gravy, so I’ve increased the amount of liquid that I use. And I added carrots. And used more onions (because I think they’re fantastic when used in a panini the next day.) But really, this is a great classic recipe. Trim all fat from roast. Brown all sides in large skillet in olive oil. It seems like a hassle, but it makes a big difference! While the meat is browning, add your onion slices and carrots to the bottom of the slow cooker. Put roast on top of onions, then pour beef broth and soup over top. Cook 9 hours on low heat in slow cooker. Serve with mashed potatoes, veggies, and gravy. Remove the liquid from the slow cooker and place in saucepan over medium heat. Add bouillon and stir until it’s completely mixed in to the broth. Mix together 2 tbsp. corn starch and 1/4 cup water. Slowly add corn starch mixture into broth, stirring constantly. Simmer over medium heat for one minute. Season if needed.